The extravaganza that is the Indian Premier League (IPL) for the 11th edition (IPL 2018) gets underway on the pitch on April 7 in Mumbai. But before that IPL 2018 mega Auction is to be held on 27 and 28 January in Bangalore. In the two-day auction, bidding will take place on 578 players which include 361 Indian players. 16 top players are on marquee list with the bidding base price of Rs 2 crore which includes some star Indian player as Yuvraj Singh, Shikhar Dhawan, Gautam Gambhir, Harbhajan Singh, Ravichandran Ashwin and Ajinkya Rahane. It includes overseas players like Glenn Maxwell, Mitchell Starc, Ben Stokes, Faf du Plessis, Shakib Hasan, Joe Root, Kane Williamson, Dwayne Bravo, Chris Gayle and Kieron Pollard. This will be one of the biggest IPL Auction after at first IPL Auction in 2008. After the retention franchises have started forming their option for the team which will lead them to the championship. When is the IPL Auction 2018? IPL Auction 2018 will be held on 27 and 28 January. What time does IPL 2018 Auction start? 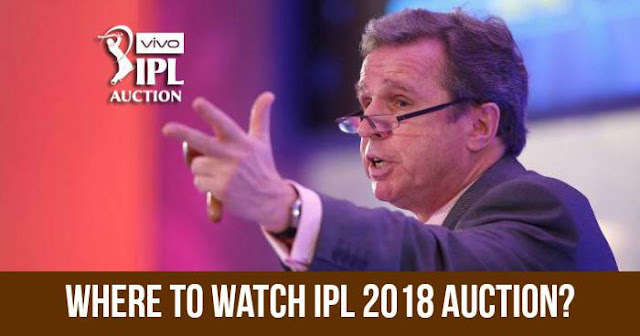 IPL Auction 2018 will start at 9 AM (IST) on 27 January. Where is the IPL Auction 2018 being held? IPL 2018 Auction will be held at the Ritz-Carlton Hotel, Bangalore. Which TV channels will telecast IPL Auction 2018 live? IPL 2018 Auction will be telecasted live on Star Sports Network. The channels are Star Sports 1, Star Sports 1 HD, Star Sports 1 Hindi, Star Sports 1 Hindi HD, Star Sports 1 Tamil and Star Sports First. How to watch IPL Auction 2018 Live online? IPL 2018 Auction can be watched online at Hotstar. Where can you follow the IPL 2018 Auction online? IPL Auction 2018 can be followed online here IPL 2018 Auction Live Updates at Cricket News.